Bitcoin (BTC) has rallied from $ 3200 to $ 5000. However, if you are a ripple (XRP) investor, things have not been good for you. Ripple (XRP) even though it has gained from the bottoms, but it is still at the level of around $ .32 where it was when Bitcoin was trading around $ 3600. That is why the reality and the expectations in ripple (XRP) are entirely different. Due to this very reason, investors are not that happy. As of today, Ripple is trading around $ 0.32. It is up by just 1%. When you look at the performance of ripple in the past month, it has been mildly positive. It has risen from $ 0.31 to $ 0.32. It indicates that in a month, Ripple (XRP) has risen by just 3%. Considering the fact that it has been under performing Bitcoin (BTC), it is actually a pretty poor performance. Many investors thought that with the improving fundamentals of Ripple (XRP), it would gain more and more prominence. With the increased prominence, it will also outperform the other cryptocurrencies and the cryptocurrency market in general. However, precisely the opposite has been happening. It is one of the main reasons why many investors are currently frustrated with ripple (XRP). When you look at the current levels as well, you will realize that it has a very little chance to go up from these levels. The next resistance is around $ 0.3334. It has retracted recently from those levels. Even if it manages to cross that resistance, there is a strong resistance around $ 0.38. It is the level where the 200-day moving average is also present. When you look at the upside, you will realize that there are multiple resistances due to which, there is very little chance that in the near term, Ripple (XRP) can outperform significantly. While in the longer term, the investors can gain due to the improving fundamentals, but the same cannot be said about the near term. With the underperformance continuing in spite of the bullish trend in most of the other cryptocurrencies, there is no relief in sight. Owing to this very reason, if you are ripple investor you might be in for a surprise due to the underperformance of the cryptocurrency. 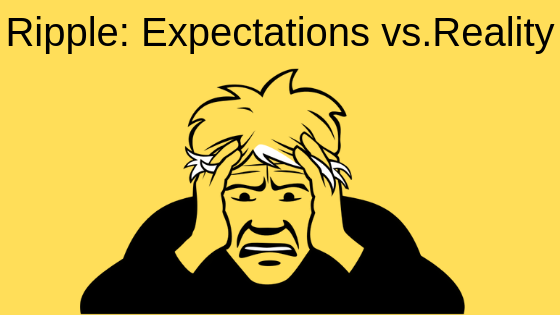 Currently, the expectations vs. reality in ripple (XRP) are entirely different. It remains to be seen when this underperformance of Ripple (XRP) finally ends. Up until now, there is no sign of the underperformance ending.